In Rewilding North America, Dave Foreman takes on arguably the biggest ecological threat of our time: the global extinction crisis. He not only explains the problem in clear and powerful terms, but also offers a bold, hopeful, scientifically credible, and practically achievable solution. Foreman begins by setting out the specific evidence that a mass extinction is happening and analyzes how humans are causing it. Adapting Aldo Leopold's idea of ecological wounds, he details human impacts on species survival in seven categories, including direct killing, habitat loss and fragmentation, exotic species, and climate change. Foreman describes recent discoveries in conservation biology that call for wildlands networks instead of isolated protected areas, and, reviewing the history of protected areas, shows how wildlands networks are a logical next step for the conservation movement. The final section describes specific approaches for designing such networks (based on the work of the Wildlands Project, an organization Foreman helped to found) and offers concrete and workable reforms for establishing them. The author closes with an inspiring and empowering call to action for scientists and activists alike. 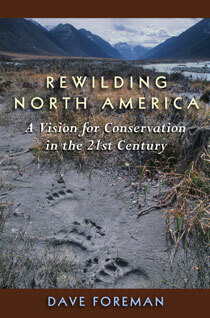 Rewilding North America offers both a vision and a strategy for reconnecting, restoring, and rewilding the North American continent, and is an essential guidebook for anyone concerned with the future of life on earth. "Foreman somehow manages to be comprehensive, historically informed, accurate, and succinct. This makes the book surprisingly well suited to serve as a text for introductory courses in ecology or conservation biology. The book's provocative vision will certainly spark interest and lively discussion."